Corporate treasurers' risk tolerance remains low as they prefer to hold record amounts of cash on their balance sheets. This is taking place at the time when companies have issued record amounts of debt to take advantage of ridiculously low rates. Increasingly however the proceeds of those bond sales and other borrowings sit in cash. 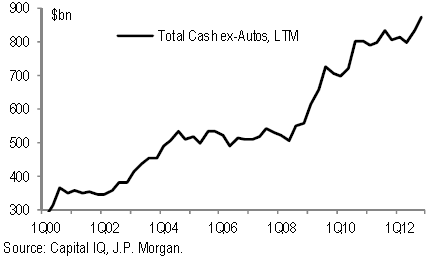 The difference between total and net debt in the chart below is cash (above). Markets are betting that some of this cash will ultimately turn into stock buybacks or dividends. Shareholders are certainly demanding it. Over time that will leave some of these firms more leveraged, and unless they "grow into" this debt, more vulnerable to downturns.